1 of 2 Heat oven to 400 degrees. In a small, lidded pot, combine maple syrup and sage. Bring to a simmer; reduce heat to low, cover and cook 15 minutes. Set aside, covered. 2 of 2 Meanwhile, in a bowl, toss squash slices with olive oil and salt. Transfer to a foil-lined baking sheet in a single layer; bake at 400 degrees for 20 minutes. 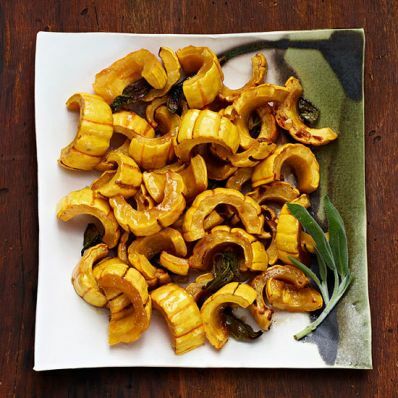 Pour maple syrup-sage mixture evenly on top of squash; bake 20 minutes more until squash is browned and tender.